Ah, Wine Tumblers, one of the great inventions for wine-lovers. No stem, less risk of tipping and easy to hold: what is not to like? There are many variations on the market: from luxury glass tumblers to unbreakable steel options. A match for every occasion! To help you make an informed decision when buying the best wine tumblers, we’ve shortlisted some of our favorite (and most highly rated) products online. These wine tumblers are perfect for drinking your wine outdoors, traveling with wine, a wine to go cup, or even used as camping wine glasses. 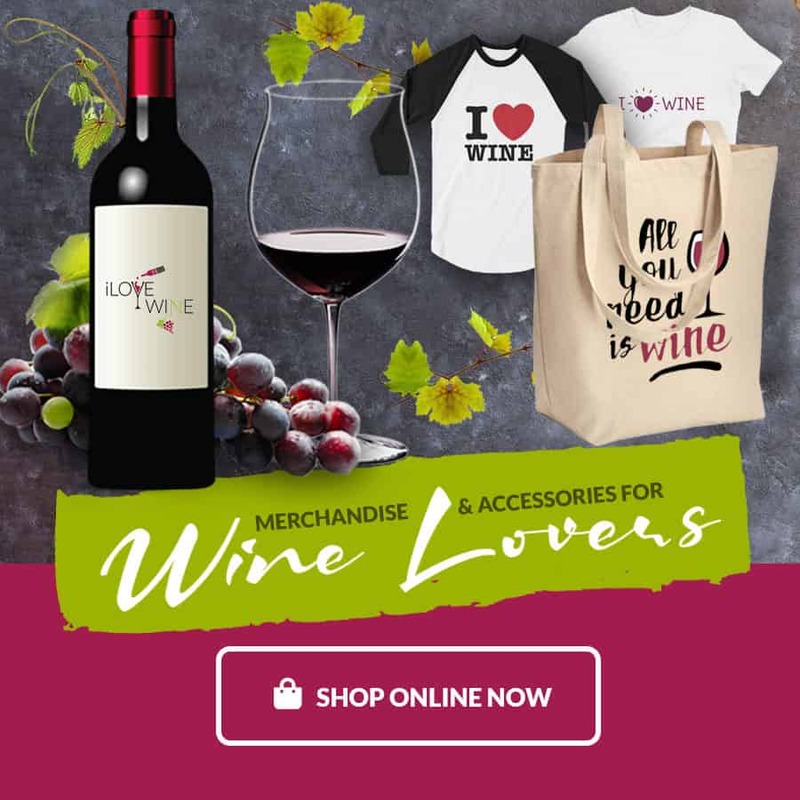 This list is divided into the Best Stainless Steel Wine Tumblers, Best Plastic Wine Tumblers, and Best Glass Wine Tumblers. If you’re looking for a durable tumbler with a contemporary look: the BBTO Set of 2 stainless steel tumblers is your match! The BBTO Set of 2 Stainless Steel Tumblers combines smart design with beautiful aesthetics. The 12oz tumblers are made of durable stainless steel and feature a removable plastic lid with a drinking straw hole. Special double-wall vacuum insulation allows your wine to retain its serving temperature for hours. Choose to fill it with rosé and sip it from the included straw. Or remove the lid of and enjoy a glass of red in style. This tumbler also includes 2 special straw cleaner-brushes: making rinsing the actual straws a breeze! The BBTO Set of 2 Stainless Steel Tumblers is available in 12 different colors. Our favorites? Rose gold is beautiful. But so is the trendy black/white marbling pattern. Choices, choices! Fortunately, with that many options, there is a tumbler for every style preference. 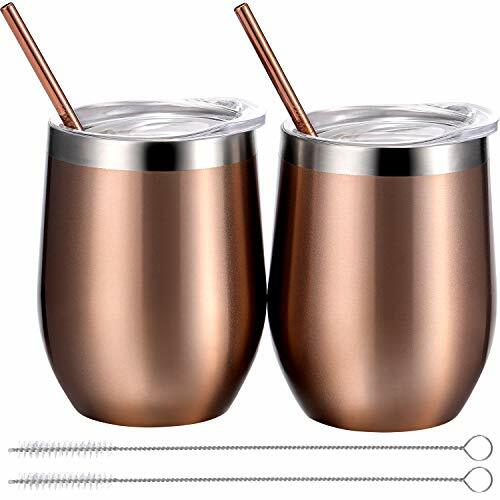 SOPHISTICATED & PERSONAL - These couple tumblers have "His" and "Her" laser printed on them and come with 2 bent stainless steel straws plus a wine bottle opener, all in a ready to give gift box. If you’re looking for a fun gift for a ‘happy couple’, the Stainless Steel Wine Tumbler HIS and HERS Set is a fantastic option! Superb as a gift for engagements or weddings, it gives the bride and groom the chance to enjoy their wine in style. And, even better, these tumblers are unbreakable. So, no matter how messy the celebrations get, these tumblers will keep going, all night long. 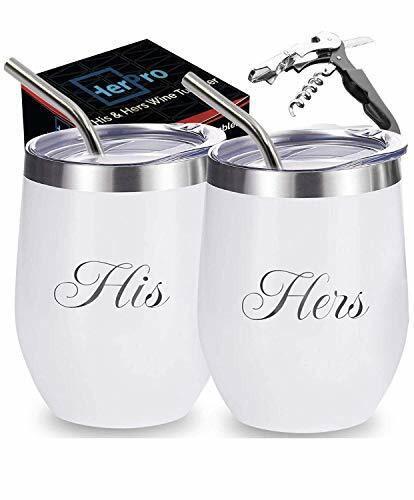 The HIS and HERS Stainless Steel Wine Tumbler Set includes 2 quality 12oz tumblers, 2 lids, 2 straws and comes with a bonus corkscrew. The tumblers are made of double wall insulated steel. They are also rust-proof and have a special powder-coated finish that minimizes fading and chipping. Though this set has very affordable pricing, it comes with high-end finishes. An example is the slider lid with a slider button to open and close. Ideal for preventing spillage between sips! The HIS and HERS Stainless Steel Wine Tumbler Set will also retain your wine’s aroma perfectly. These are choice for great camping wine glasses. Why? Well, the polished steel interior does not affect taste and resists bacterial growth. Another bonus is that the included curved straws are also made of sleek stainless steel; extra stylish and durable. So, if you’re in need of an original present for an upcoming engagement or wedding party: get this set. Also a great gift for Valentine’s Day or anniversaries. You don’t need to put a ring on it to add these glasses to your collection. Cheers! FREE RECIPE & TIPS EBOOK: We've created a 15 Tips & Recipes for the Perfect Backyard Party Ebook for Backyard Bum customers ONLY! 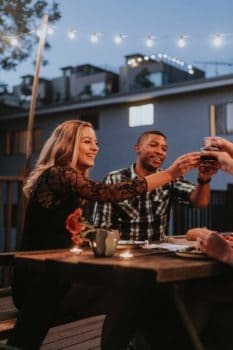 Let us take the stress out of that next dinner party or backyard gathering by using our delicious recipes and helpful tips. Order now and receive an email with your EBook download of delicious recipes, tips and suggestions. So, check your inbox. Your joy is ours! The Backyard Bum Stainless Steel Set is great for BIG wine drinkers. These large stainless steel tumblers have an 18oz capacity, sizing up from regular 12oz tumblers. This sleek, dishwasher-safe wine tumbler set includes 4 glasses and comes with a bonus Recipe eBook. This eBook includes 15 tips and recipes to inspire you to have fun with your glasses and take your dinner party to the next level. Some stainless steel tumblers can feel unbalanced, but the Premium Solid Stainless Steel tumbler set has a weighted base to make them tip-resistant and very stable. 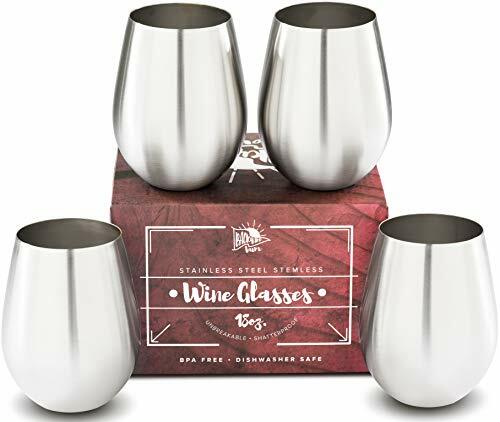 This set does not add a metal taste to your wine, as the quality stainless steel formula is of high-end ‘food-grade’; used in professional cooking and more. The Premium Solid Stainless Steel Wine Glasses set also comes with a ‘Lifetime Guarantee’. If the glasses do not live up to their unbreakable promise, simply contact the company and let them take care of it for you. This shows that the makers are a 100% confident in the quality of this product, making it an authentic choice in best wine tumblers. Appearance: Drink STYLISHLY with these CHIC MODERN stemless wine glasses. 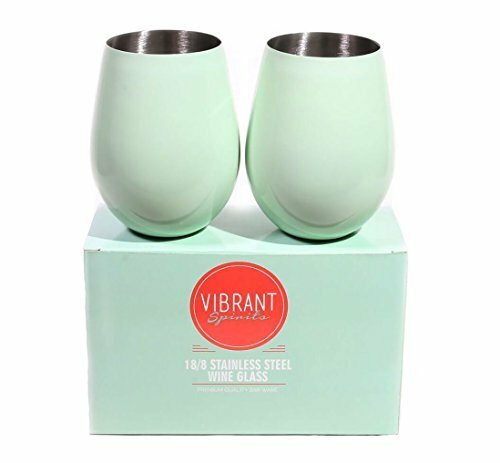 These wine tumblers are coated with a MINT GREEN COLOR and have a glossy finish. The rounded interior walls allows you to swirl your drink and sits comfortable on your hand. Though we’ve already included various stainless steel sets on this best tumbler list, we simply couldn’t ignore the Set of Two 18-oz Tumblers. Why? Because this chic set comes in a gorgeous mint green color with a glossy finish. Bang on trend and perfect for spring and summer. Made of high-quality, food-grade stainless steel, the tumblers are sturdy, unbreakable and will last a long time. The glasses have a large 18-oz capacity and are rust-proof for added durability. [Cleaning Sponge and Gift Card Included] With the NANOMATERIAL sponge you can clean the cup easily. A elegant gift card with small metal ornament is prepared for you. 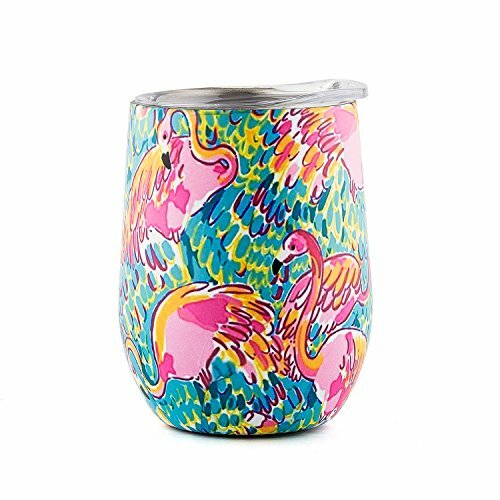 It’s a shatterproof, stainless steel wine tumbler with FLAMINGOS. Perfectly balanced heavy base, feels good in hand. 12 ounce capacity. Also great for cocktails, beer, margaritas, ice water, soft drinks, Iced Coffee. Hot or cold liquids. 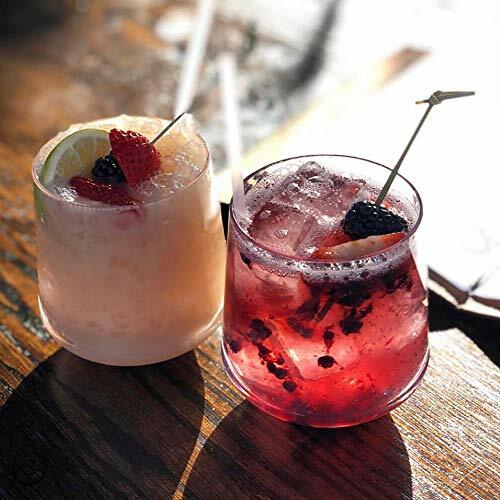 The Drinique Stemless Tritan Set is one of the best plastic tumbler choices on the market. This beautiful 24-piece tumbler set has the look and feel of glass: but it’s actually made out of premium copolyester. Ideal for impressing your friends with at a pool party, barbeque, picknick, a day at the beach and more… All without the chance of shattering or glass splinters! 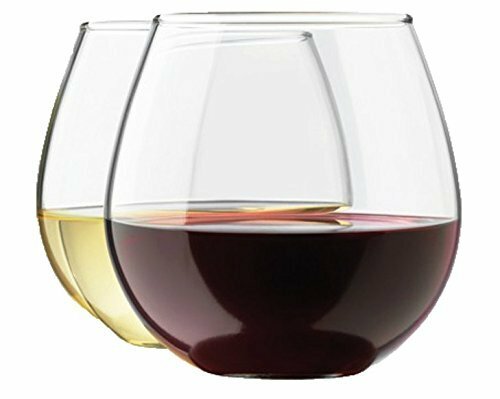 Each of the Drinique Stemless Tritan Wine Glasses features a perfectly balanced, quite heavy-base. This makes it very stable and comfortable to hold and swirl. The tumblers have a 12-ounce capacity and are made of ‘unbreakable’ 100% Eastman Tritan copolyester. Drinique is actually so sure these tumblers will last you forever, that it gives an ‘Unbreakable Lifetime Guarantee’ against breaking and cracking. The Drinique wine tumblers are dishwasher-safe, even on high-temperature cycles and stay beautifully transparent, even after hundreds of washes. 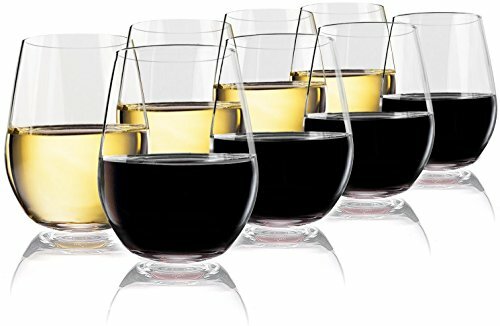 If you’re looking for the best wine tumblers that look and feel just like glass, but are shatterproof and ideally suited for outdoor drinking: the Drinique Stemless Tritan Wine Glasses Set is one the best choices! SUPERIOR TRITAN INDESTRUCTIBLE BUILD: This unique set of drinking glasses is made out of superior Tritan copolyester that makes each glass impact and shatter resistant. This premium material feels and looks like glass but it's far more durable than any other plain glass or plastic drinkware set out there. Feel free to get as clumsy as you want with our glasses, and enjoy your favorite beverages at home, patio or any pool, boating, camping, picnic, hiking or outdoors excursion that you wish! Vivocci’s Unbreakable Plastic Stemless Wine Glasses is a fantastic value-for-money buy. The tumblers have a 20-oz capacity and feature a special ‘Tritan Indestructible Build’. A fancy term that refers to the material used to create the tumblers: Tritan copolyester. Though you might be fooled in thinking these are glass tumblers, as they look and feel like the real deal, they’re actually plastic. They are ideal for wine-lovers who drop their tumbler once in a while. This set allows you to get as clumsy as you can get: your Vivocci tumbler will definitely last longer than you do after a few drinks too many! The Vivocci Unbreakable Plastic Stemless Wine Glasses are a 100% dishwasher safe, free of any harmful chemicals and sturdy enough to last hundreds of washing cycles. Having extensively tested its glasses, Vivocci even offers a full Money Back Guarantee to guarantee the products longevity. Another bonus about the Vivocci wine tumblers is that you can choose how many glasses you want in a set: 2, 4 or 8, meaning you won’t suddenly find yourself with too many glasses and not enough cupboard space. The Scott Zwiesel Tritan Crystal tumblers are a pure luxury and the ultimate indulgence for wine-lovers. Zwiesel, a renowned German glass producer, has been a staple name in wine glasses for over a 100 years. Winner of the title ‘The Best Cyrstal Glassware’, we can fully vouch for the quality and authenticity of this brand. This set includes 6 stemless tumblers with a 16-oz capacity and is dishwasher-safe. The premium Zwiesel wine tumblers are made of patented Tritan Glass. This material, developed by the company itself, is super durable and adds a ‘titanium strength’ to the design. It also makes the tumblers much more scratch and chip resistant for everyday usage. Another benefit of Tritan Glass is that it offers sparkling clarity: making your red wines look even more sumptuous! 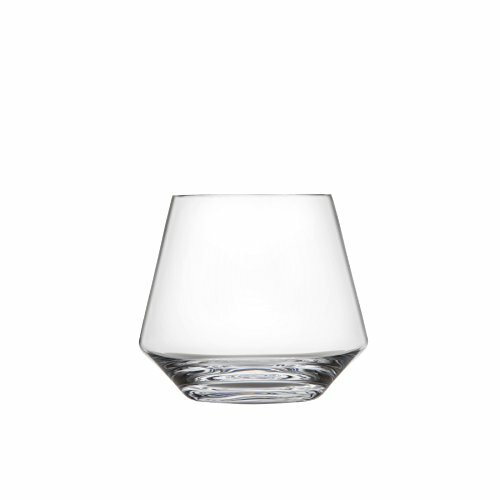 There are various Scott Zwiesel tumblers available, but we’re particularly fond of this beautifully geometric silhouette. The company’s designers have created the shape especially to draw out the complexity of your wine’s characteristics. Swirl it around and let the glass work its magic. It should make your wine taste even better. Maybe it is a placebo effect, but we are convinced. The prettier the glass you drink from, the nicer your wine tastes! The Royal Stemless 15-oz Tumbler Set by Equinox International is an excellent choice for wine lovers that want a simple, elegant and affordable set of glass tumblers. It comes with a very attractive price-tag but does not compromise on quality. The set includes 8 glass wine tumblers with a 15-oz capacity. Made of high-quality, durable glass they are easy to clean, relatively scratch-resistant and also top-rack dishwasher-safe. With an ergonomic, rounded silhouette, they fit comfortably in your hand. And make swirling your wine look very sophisticated. Delicately balanced for maximum stability and stackable for easy storage. The Royal Stemless 15-oz Tumbler Set is one of the best wine tumbler choices for wine-lovers on a budget. 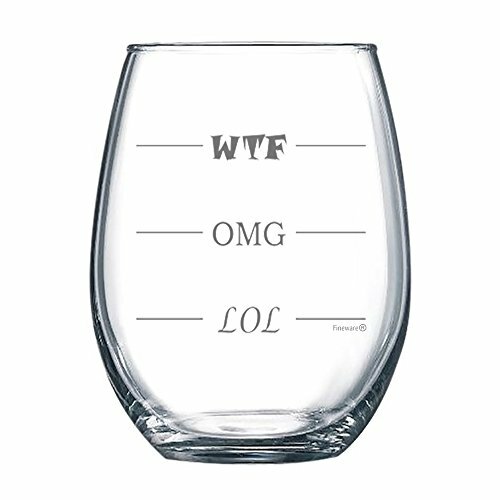 Fineware LOL-OMG-WTF 15 oz Stemless Funny Wine Glass - Finally a Wine Glass for Every Mood! Funny LOL-OMG-WTF Stemless Wine Glass! Finally, a Wine Glass for Every Mood! The Fineware LOL-OMG-WTF 15oz Wine Tumbler is a fun glass tumbler to help you express your mood. Rated as one of the best wine tumblers by consumers, it’s a humorous addition to your wine glass collection or a great gift for wine-lovers. The tumbler is made by French manufacturer Arc International. This quality name in glassware has been in business since 1825; giving it a rich heritage and all the expertise needed to create the perfect wine tumbler. The LOL-OMG-WTF 15oz Wine Tumbler has sandblasted engraving, making this etching a 100% permanent and dishwasher safe. This quality wine tumbler also makes an original gift for any occasion and lets you express your feelings by simply filling your glass to the desired LOL, OMG or WTF level!